Welcome to The Holy Grail of Marketing for Landscapers! Knowledge is Power... Feel powerless or uncertain about your internet marketing strategy? Read our guide to get the knowledge you need to empower your website and marketing. The Holy Grail of Marketing for Landscapers ebook is the key to unlocking business success. It's jam-packed with everything you'll ever need to know about implementing a winning online and offline marketing strategy for your landscaping business. The Bible of Marketing for Landscaping Companies! 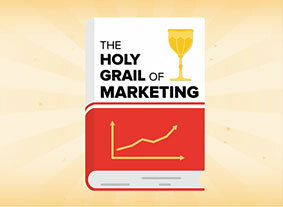 The Holy Grail of Marketing for Landscapers is THE Bible of marketing and a must-read for any landscaping business. With over 100 pages of detailed information on how to outperform your competitors with an effective website and marketing strategy. Plus links to the best Online Marketing Tools & Resources on the Internet! Enter your info below with a working email address and we’ll send you a download link in seconds. "This ebook delivers on exactly what it said it would. Demistify the entire online marketing process. Truly a fantastic read!" "Finally, a free how-to guide on marketing that has become the roadmap for our marketing manager." "I thought I had a good grasp of online marketing until I read this outstanding ebook. A must read for any small business." * Disclaimer: This ebook is copyrighted by Clear Imaging, Inc. 2017. By downloading this free ebook you agree not to copy, replicate or redistribute it without prior written consent from Clear Imaging, Inc.